This really did start out as one of those "six degrees of separation" chains by which I have tried in this series of entries to "relate everything to Naples." (See #1 in the series.) They're fun to write, and this one pretty much wrote itself, teaching me a few things along the way. That's hard to beat. Out of the blue, friend Warren asked me if I knew anything about Sabrina Spielrein. I knew nothing (my motto for most of the rest of this entry!). She was Russian, born in 1885 and is now viewed as one of the early practitioners of psychotherapy. She was a student of Carl Gustav Jung, apparently had an intimate relationship with him, and she knew Sigmund Freud. She influenced both of them (or, in the words of friend Warren: "In a way it's the psychoanalytic equivalent of the DNA story. Watson and Crick get all the credit, and Rosalind Franklin is all but forgotten.") In the last ten years, however, there have been books, plays and films about Spielrein, the most recent of which is the 2011 film, A Dangerous Method. We may recognize Carus as a precursor of Jung. They are alike not only in their interest in the unconscious psyche...Both are medical psychologists, empiricists, observers of phenomena and in relationship with the living psyche from which they make inductions. At the same time, they are both holists, attempting to penetrate with their vision through the phenomena to the archetypal background of life. So, there was the second C.G. and I had never heard of him! He was born in Leipzig in 1789 and died in 1869. He not only belonged to the Age of Goethe in Germany, but was even his friend, and like Goethe, Carus was a polymath, one of those "universal scholars," whose interests and abilities ranged across a stunning array of disciplines. He was a philosopher, physiologist, doctor, naturalist, psychologist and respected painter. His many written works range from Foundations of Comparative Anatomy and Physiology, to Psyche—On the Development of the Soul, and Letters on Landscape Painting, the last of which was very influential in the development of German Romantic painting. Carus, like Goethe, was also a Grand Tourist. A Trip through Germany, Italy and Switzerland in the Year 1828 is of particular interest to me since it has descriptions of the Gulf of Naples. His most intriguing comments, however, about Naples are not in writing. They're on canvas. Carus' paintings are generally landscapes and show his fascination with moonlight and the night sky. 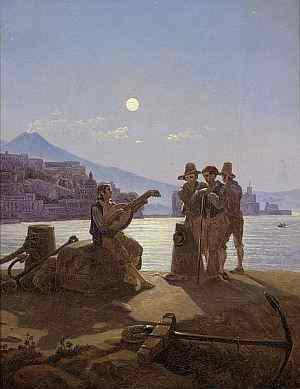 He has one, for example—Italian Fishermen in the Bay of Naples (image, top of page)—in which the figures in the foreground are almost secondary; your eye is drawn first not to them but to the moon, the light on the water and to Vesuvius in the background. 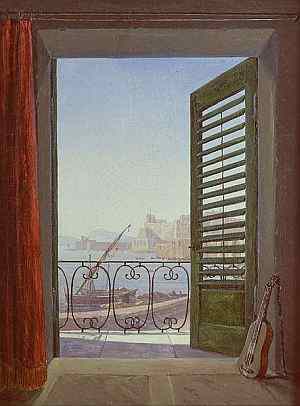 I don't know that Carus lived in that room when he was in Naples, but I suspect he must have. He would be unhappy to know that the view is totally obscured today; the entire area in front of his room and balcony was built over in the 1890s during the splurge of urbanization known as the risanamento. Today he would be looking at the backs of a long string of high-rise hotels. Warren said—when I asked him for help in finding a message in all this— that "maybe looking at the backs of a long string of high-rise hotels is the message." The guitar? It's smaller than the modern guitar and seems typical of Italian guitars of that period. I don't know if Carl Gustav Carus was a musician, but it wouldn't surprise me. Hillman, James (1992). "An Introductory note: C.G, Carus—C.J. Jung" in Carl Gustav Jung: critical assessments. Editor, Renos K. Papadopoulos. London. Routledge. Jung, C.G. ( 1969). The Archetypes and the Collective Unconscious, Collected Works, Volume 9i, Princeton, N.J.: Princeton University Press.